There’s no question that the gentrification gap in San Francisco is ever-widening. A walk down Market Street — where tech giants and start-up offices pepper a neighborhood overrun by poverty — is a testament to that. And, now more than ever, there is immense pressure for these tech companies to give back to the community. Enter Lava Mae (similar to “wash me” in Spanish), the project from the Tides Center, seeks to provide showers and toilets to people in the Tenderloin and San Francisco’s Mission neighborhood who lack access to these basic necessities. Lava Mae’s founder, public relations executive Doniece Sandoval, says her passion for the project was sparked after passing a woman in her neighborhood who was crying because she had not been able to clean herself for days. Moved, Sandoval went without a shower for several days. 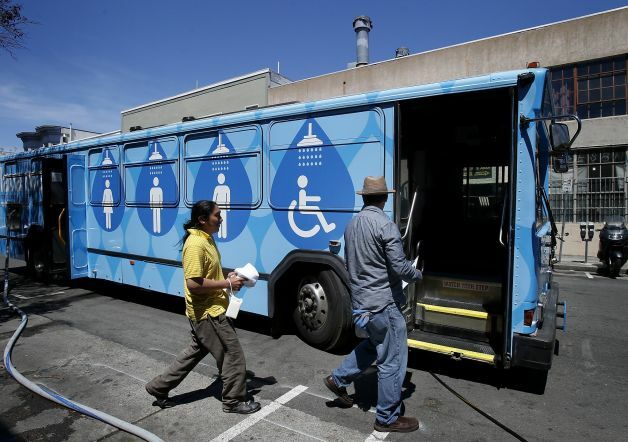 Last year, the team retrofitted a decommissioned bus with two showers and two toilets, and as of June 2014, now offers services to people in the Tenderloin and Mission areas during the week. Since the city is planning to transition to bio-diesel hybrid vehicles, the SFMTA donated a decommissioned bus for the project. Run like a non-profit, financed like a startup, and welcoming like a neighboring food truck, Sandoval says Lava Mae is in the hospitality business, emphasizing collaboration above all else. On Thursdays and Fridays, the bus is parked in the Tenderloin. Everyone gets 10 minutes at this location. Saturdays in the Mission are not as crowded so guests are allotted 15 minutes for a shower. When whole families sign up, the team allots an hour in the larger stall. Not only are the buses efficient, they’re also tech-savvy, allowing guests to preregister (if they so choose) via an app. That may sound counterintuitive, but as Sandoval recently told Wired, it is a common misconception that homeless people do not have access to smartphones or Wi-Fi. Lava Mae intends to make registering for the service as simple as possible. Kudos to Google for supporting this worthy cause. Hopefully we will see more Lava Mae buses rolling around the city soon.